Doors and windows are a critical part of the insulation in any building. You want them to be able to keep in the heat while keeping out the cold. You also want to make sure your energy bills are significantly reduced. So how well do sash windows fare in terms of these functions? Well, no particular window design is distinctively energy efficient. Rather, it is our conscious effort to adapt and enhance these windows that makes them appropriate for draught proofing or insulation. The same applies to sash windows. If they are broken, or left to deteriorate or simply never repaired, then they’ll be energy inefficient. With this in mind, how can you convert your sash windows to a more energy-efficient design? While some companies may advice uPVC as the most energy efficient alternative, it is totally unnecessary and could change the look or value of your property. Instead, there are a number of simple refurbishments you can do to make your sash windows better insulated and weather-proof. Over time, wood frames can warp and deflect resulting in gaps and eventually, draughts. Many companies specialise in fixing sash window frames and fitting them with draught-proof strips. This can significantly lower the effect of draught and heat loss. According to research, draught-stripping can reduce draught by up to 90%. Windows can also lose heat through the glass itself, but research has also shown that heavy curtains or close-fitting roller blinds can reduce heat loss by more 30%. Secondary glazing supplements the window with a second glass pane. There is usually a gap between this pane and the existing window; a heavy gas such as argon or xenon is filled in to create that extra insulation. Secondary glazing automatically cuts the quantity of heat lost by up to 60%. For period-style windows or replacement windows which need to preserve their historic pattern, it may be ideal to add double glazing. Many conventional windows need to be renovated during double-glazing because the sash windows may not be able to hold the extra thickness and weight of the new double glazed units. In traditional windows, the glass may be 3mm thick while many double-glazing units are between 12 and 14mm thick, in some cases more. This is a common problem, especially where windows have small panes partitioned by light glazing bars that are not as deep or wide enough to contain the double-glazed units. Sash windows are usually equipped with internal shutters which keep in heat at night. But as developments in cheap heating alternatives increased, some manufacturers ceased to include the internal shutters. You can choose to restore the shutters because they not only increase insulation, but enhance the original period look of the windows. 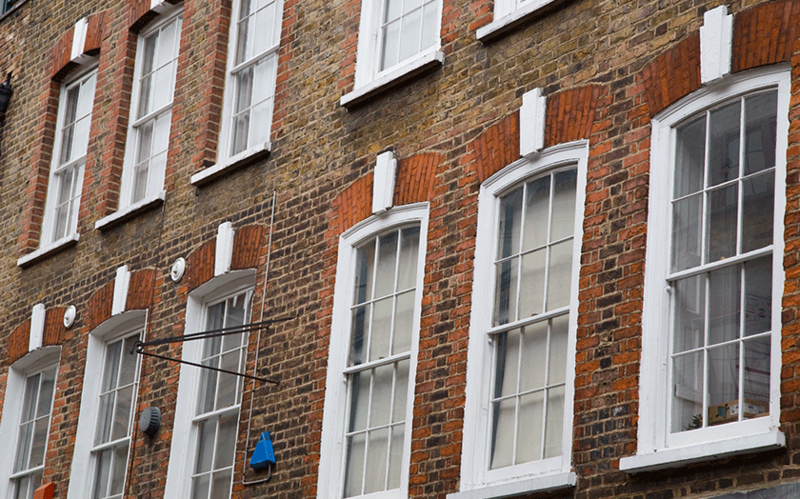 Why maintain the look of your sash windows? Historic windows, original or replacements, always add style and character to period buildings. It is therefore right that they be maintained or restored. If they are beyond repair then they should be replaced with exact copies. If your building is listed under the conservation act, you will require some consent to do so. Consult your local planning council if in doubt.